Eat What You Love, Love What You Eat by Michelle May, M.D. The purchase came after a night of ‘binging’. I felt ashamed and gross. I knew that my relationship with food, hunger, and my body was much deeper than I am willing to admit. I know that I still don’t understand hunger and fullness cues. I know I still try to control my life with food. I knew this is not what I saw in my future or wanted to deal with anymore. I wanted to have that sense of calmness and be able to not only enjoy food, my body, but my life. With no hesitations. Without having to work at it. I wanted to be able to help others find the path of peace with food, a path I was still not on. The book came in the mail yesterday and I am already addicted. I feel a sense of peace over the fact that the author will teach me intuitive eating. This is what I always wanted, this is what I always needed. 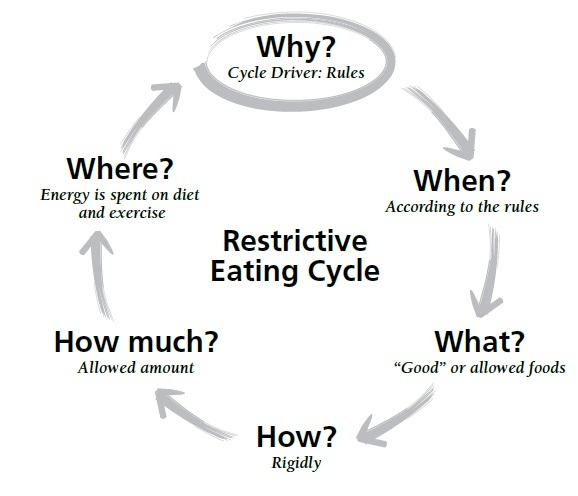 The first section forces you to decide if you are living in the instinctive eating cycle, overeating eating cycle, or restrictive eating cycle. When I went into it, my Ed was screaming in my head, you are an overeater. You eat when you feel weak and you eat when you realize you are alone. You overeat and like the millions of other obese people who eat their feelings. Alaina took over and read the book. I realized I am and always have been in the restrictive eating cycle. What made me realize this? RULES. Here’s the scary part: I cannot remember a time in my life I didn’t live by rules. Perhaps its part of my personality, obeying rules is my thing. But food rules… food rules are a different story. I can distinctly remember being a toddler and already categorizing food as good or bad. I remember thinking that when I was older, I would NOT be allowed to have candy or dessert so I had to enjoy it now. I remember going to school and thinking about how I must share my lunch with friends so I ate less than them. I remember waking up each morning, not eating breakfast to save ‘calories’ for later on. I remember purposely not eating so that my pants would feel better. I remember being sick and blaming it on eating poorly and being obese. I remember having friend problems and contributing it to my weight. I remember trying to lose weight to get more friends. I remember this all and not telling anyone because I was under the impression only I had to live by food rules. Only I had to deal with this. Did I mention this was all before 3rd grade? My food rules only got worse as I got older and of course, eventually lead to my eating disorder. I lived by rules and even in ‘recovery’ I strictly followed all the rules. My nutritionist gave me rules, my parents did, articles and books did. I continued to only eat by rules. When I was getting better, new rules took over. 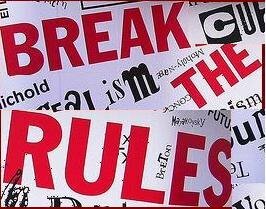 Rules that forced me to eat more than I wanted to and forcing myself to not eat food that were once ‘safe’. I bounce back and forth between restrictive rules and binge rules. To my surprise, Eat What you Love, Love What you eat, tells me I don’t need rules. My body can function and tell me what to eat, how much, how often and what not without my dictating it. This is Chapter One, in which I leave the control behind and become in charge. Instead of yo-yoing (thats not a real word, NBD) I am going to learn to let my body and eating relax, and focus my attention and energy on other things other than RULES. News Flash: My body has a innate tool called hunger. And after reading Chapter two, I think I finally understand just what it is. For 21 years, I have denied my body when it was hungry and forced it food when it wasn’t because I refused to let my body function naturally. And up until yesterday, I could not understand hunger cues. When I thought about food was I hungry? Should I let my stomach growl some? Should I be ready to eat an arm off before eating? What is my hunger and what is me obsessing over food. Thank you, chapter two for teaching me trust my body wisdom, for it knows better than RULES. To be honest, I’m scared. To let go. To throw all those rules away and finally trust my body. To be honest (again), me and my body are like two sisters who continually fight. We need to get along but I feel disconnected and not trusting of it. Not to mention, I have always had rules. It’s a scary concept but I willing to try it. I am willing to work hard to work with my body and not against it. I am willing to accept peace and flexibility into my life. Are you? Have you read Eat What you love, love what you eat by Michelle May? Please tell me more! What rules do you have with food and are you willing to let them go? I think for me, it has so much to do with my personality. I can’t help myself, gosh I wish I could but I am just made that way…. Seems like a super intersting read!